Living entirely indoors improves your cat’s life expectancy. That’s a huge benefit you’ll both enjoy, but keep in mind that it can also hinder her natural instinct to hunt, and might limit her space for exercise and exploring. A bored cat can also be a destructive cat. A few simple tips will help beat boredom and enrich your cat’s life with activities that foster her natural behaviors, for a long life full of cat (and people) pleasing adventures. Simulate hunting behaviors with toys and games. Cats are naturally wired to stalk, leap and pounce. Bring out her inner hunter with a variety of toys for both independent and one-on-one play time. Try to play with your cat at least twice a day, ideally in the early morning and evening when she is naturally the most active. Pole-style toys with hanging feathers and strings are great for playing together. When you’re away, leave toy mice or balls on the floor for her to stalk, pounce and bat around. As a special treat, you can stuff her toys with catnip or treats. Create a puzzle feeder for more interactive meals and snacks. Take a small round plastic food container and carefully cut a few holes in the sides. Fill with kibble or treats, replace the lid and let her bat and play with the container to get the food out. If you have a cardboard box, turn it on its side and cut out a few “windows”. Tie strings to a few toys and hang them from the top of the box. Place a ping-pong ball in your empty bathtub, and let your cat bat it around and around. Keep toys interesting by rotating them. Instead of buying new toys, keep a few stashed away, and swap them out every couple days to keep her from getting bored with them. Blow soap bubbles for your cat to hunt and catch. This is sure to entertain both of you for hours! If you have a laser pointer, a game of ‘catch the red dot’ provides exercise and entertainment. Just be sure not to point it at your cat’s eyes, and end the game with a reward like a stuffed toy or treat. This will end the hunting sequence in a fulfilling way. Let your cat forage for her food. Cats instinctively forage for food in the wild. You can foster this natural behavior by breaking her daily food amount into smaller portions to place around the house. Put the food in open areas, not hiding places, so she can survey her territory while she eats. Also, try putting treats in a couple different spots for her to find. Let her experience the great outdoors safely. Bird watching can create hours of excitement for your cat. Make a comfortable spot for your cat to perch next to the window (ensure the window is secure first). For even more stimulation, attach a suction cup bird feeder to the window to give your cat a close-up look at her feathered “friends”. If you have a yard, consider buying an outdoor enclosure or crate, which allows your cat to get some fresh air while keeping her safe. If you have a properly fitted cat harness, and your cat has had training using it, you can also take her outside to explore. If you take her outside, make sure she has flea and tick prevention and appropriate vaccinations. It’s also important to create an indoor environment that supports your cat’s natural behaviors. Give her safe places to climb, scratch, hide and nap. 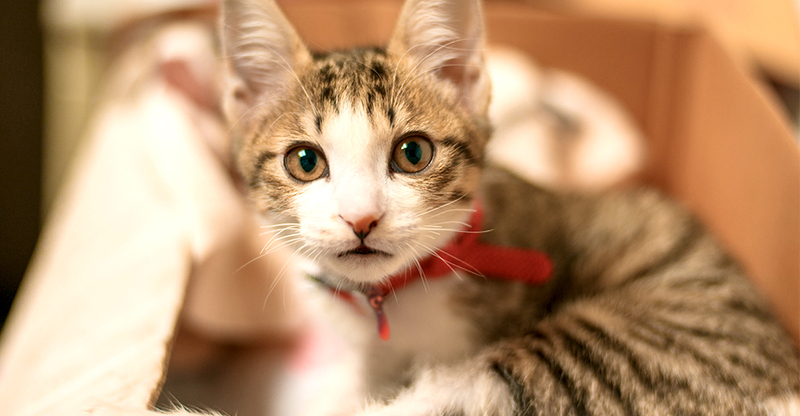 See our Catification tips to help your cat feel in control and content in your home.